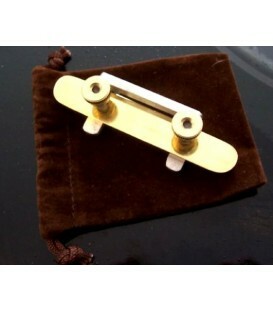 Mikes Banjo Mute reduces volume to make practicing quieter. Parts are cut, polished, and assembled by hand and individually tested to ensure consistent quality. The force required to attach or remove some mutes can move the bridge. Instead, Mikes Banjo Mute goes on and off easily. 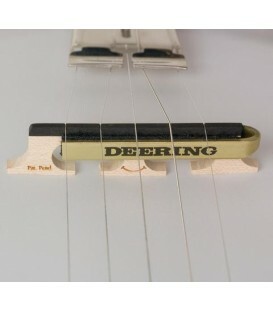 The hook of soft aluminum holds firmly but gently to the cutouts in the bridge while solid brass rests on top to very effectively mute the banjo to a level that wont disturb others in close proximity. 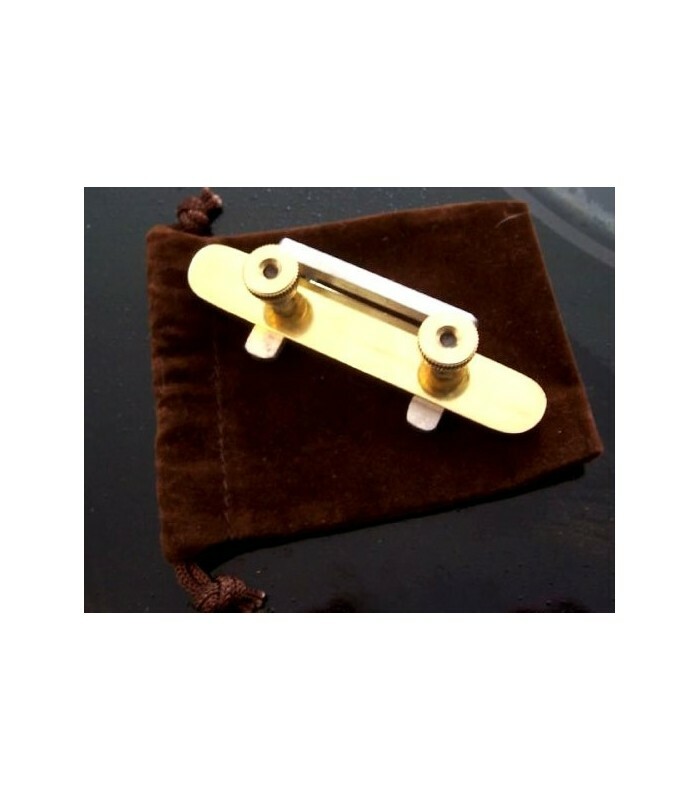 Fixed nylon screws that won't move or scratch the bridge hold it snugly in place. With the mute on, your banjo plays slightly quieter than a guitar at normal volume so it becomes a great play along instrument. It generates no string buzz or metallic sound and offers an enhanced sustain. It relieves your spouse of hearing the 300th rendition of Foggy Mountain Breakdown, or the fumbling twangs of a song in early practice. 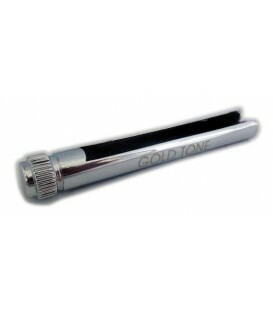 Its great for midnight and early morning pickers and those playing away from home in a hotel room or office. Choose Mute and Click "Add to Cart"
Mikes Banjo Mute completely detaches from the banjo for regular play to avoid any unwanted overtones. Mike’s Banjo Mute has a low 3/8” profile above the bridge, avoiding any interference with proper hand positioning during play. With its convenient petite size (2 ¾ x ¾ x ¾) and protective storage bag, Mike’s Banjo Mute fits in any case and easily travels with you wherever you go. Works Great - even on a compensated bridge I had been told that there wasn't a mute that could work with a bridge like the one I have. 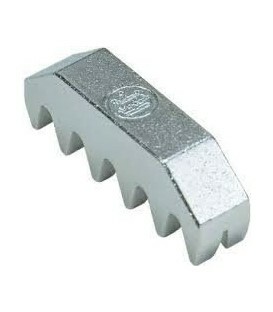 I saw in the literature that this mute would work on most compensated bridges, so I ordered it. It works just fine on my bridge. It really does go on and off easily. And it not only makes the banjo quieter, it gives it a completely different tone quality that can have real musical applications. keeps peace in this household. This mute works very well, it seems to mute more than others reviewed which is what keeps peace in this household.